Better a microcement floor or a resin coating? Home / Ideal News / Microcement or resin floors? – The resin floor has an epoxy base with thermosetting polymers, it has a shiny effect and it can be subject to yellowing over time. 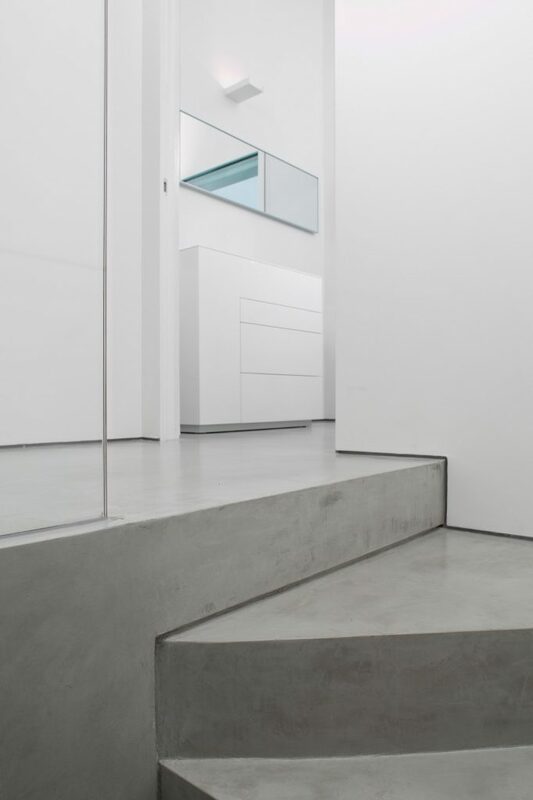 – The concrete floor and the microcement coatings have a cement base and are characterised by a higher tactility and a more natural effect; the microcement is not a resin, therefore it’s not subject to bubbles or yellowing. 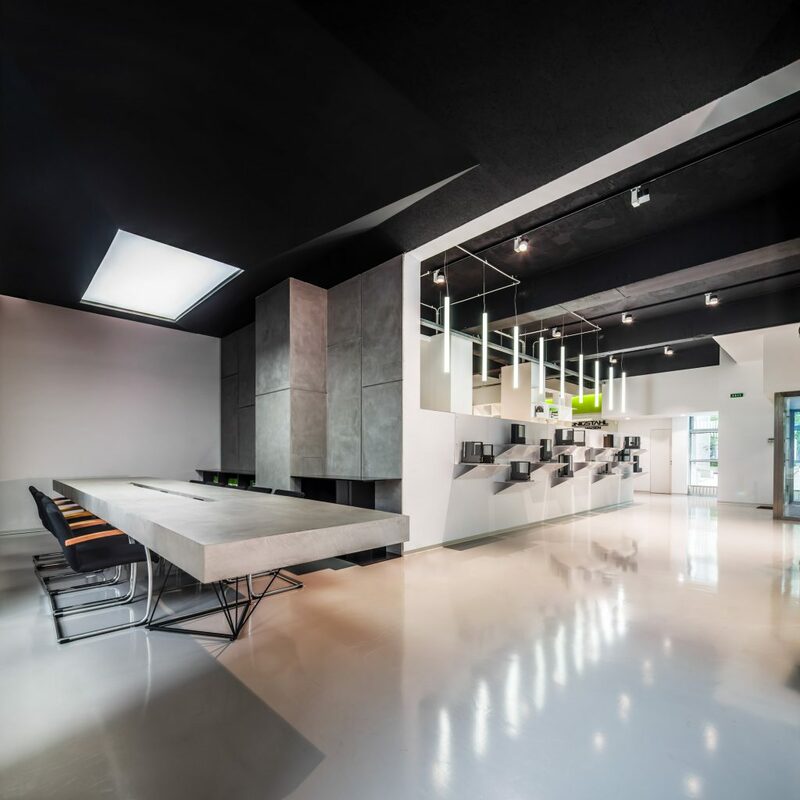 This cement coating can cover not only the floor, like the resin coating, but also any vertical surface, ceilings and many different additional elements. Resins for floors usually identify those floors one can obtain through the use of self-leveling resins and were initially used to protect the surfaces of factories and chemical laboratories, food industries, meat lockers and butcheries. Today, although their use is more suitable to the industrial field, epoxy resin is widespread also on a residential scale for its capacity to create seamless floors. Unlike the microcement coating, it has a shiny, plastic look, a lower wear resistance, and it tends to yellow over time. To a non-expert look they can seem very similar, but the resin floor and the microcement floor are actually very different. The final result represents the main difference, since the resin floor has a shiny but plastic effect, whilst the microcement coating gives the floor a more natural and tactile effect. The microcement’s concrete effect is not to be underestimated because it is extremely customizable in the colour and in the effect, so the final result will overtake the classic grey and the surfaces will look unique and modern. One of resin floors’ main problems is the yellowing process over time, caused by a limited resistance to UV rays and to the sun’s effect. There are some retardant treatments but they don’t solve the problem and if one decides to install a resin floor, they must be aware that they will have to face the unease of a yellowed, anti-aesthetic floor. With the microcement (Ideal Work’s Microtopping®), instead, it’s possible to create floors and coatings with a high resistance to UV rays and, thanks to some special protective treatments, these surfaces won’t undergo yellowing over time. This represents a great advantage compared to resin surfaces, because this way one can choose a very light colour without the risk of seeing it turning yellow as time goes by. Microcement, however, like all other kinds of materials (for example car’s paints), after a constat exposition to the sunlight or the moonlight might undergo a light modification of colour, which cannot be considered as a flaw though. Compared to resin coatings, microcement is extremely ductile and it can therefore be used to cover anything, not only the floor as in the case of epoxy resin. This allows to decorate and modernise whole areas by following the same style. Both are often chosen for internal restauration: resin and microcement have a very different composition though. Resin floors are composed of epoxy resin, which mainly results from the processing of petrol. It is therefore a plastic material. The concrete floor is composed of a cement mix with a small percentage of polymers which improves its ductility and its performance. The result is a concrete effect, tactile and velvety. Floors in epoxy resin, if treated with particular protections, are resistant to weather conditions too, but they suffer the damages resulting from the sunlight and UV rays, with a consequent yellowing process. 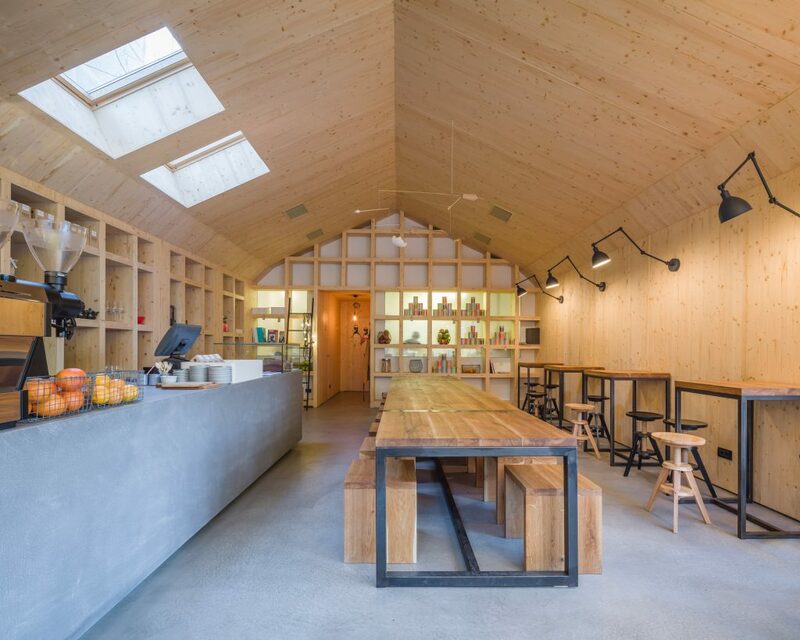 Amongst the various surface coatings, the microcement floor and the resin floor allow to create a seamless surface. A continuous surface is not only good-looking, it also gives the perception of enlarging the space, along with being easy and quick to clean. Compared to an epoxy resin, which allows to only create floors, the microcement flatwork Microtopping® allows to coat whole rooms with a continuous effect because it is applicable to walls and any other surface: on the bathroom surfaces, on the kitchen’s countertop, on the fireplace etc. To obtain a seamless surface in your house it’s not necessary to demolish the old floor; a seamless floor doesn’t require the existing surfaces to be demolished to insert joints inside of them. With a concrete floor one can obtain multiple combinations of colours and effects, all of which are customizable in the shade and intensity of colour. This is possible thanks to the handcrafted application by Ideal Work®’s authorized applicators. That’s why every Ideal Work® floor is unique; moreover, installing the floor in a handcrafted way allows to modify the final result of the shade and the intensity of the colour up until just before the application. Resin is also available in many different colours, but with microcement the possible combinations are endless and suitable for all kinds of surfaces, floors and walls included. From white to different shades of grey, through various shades of brown and red, to brighter colours such as sky blue, aquamarine, lavender and many more. It is also possible to create a rough concrete effect floor, but also a wood effect, a semi-matt or a polish effect floor; the possible combinations are infinite and artisanal. Check out Ideal Work’s microcement colours and customize your own choice! 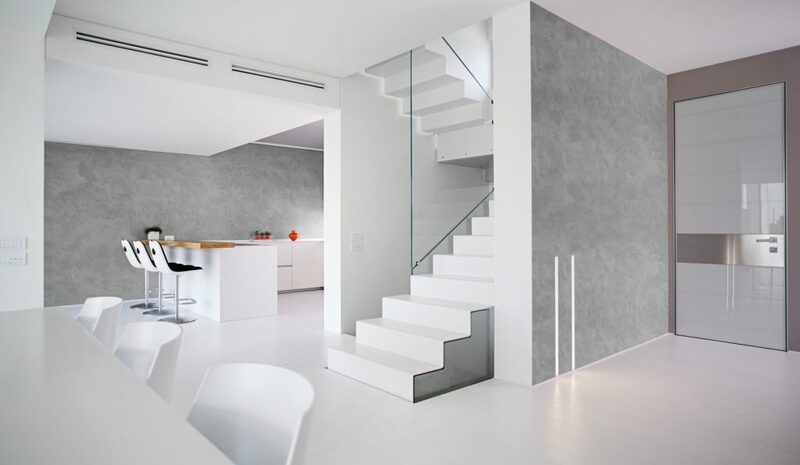 A warm minimalism, geometries and combinations of white and grey for a house with an essential style where Ideal Work®’s microcement coating Microtopping® has been chosen for the kitchen’s walls, the stairs, the bathrooms and the basement’s floor. 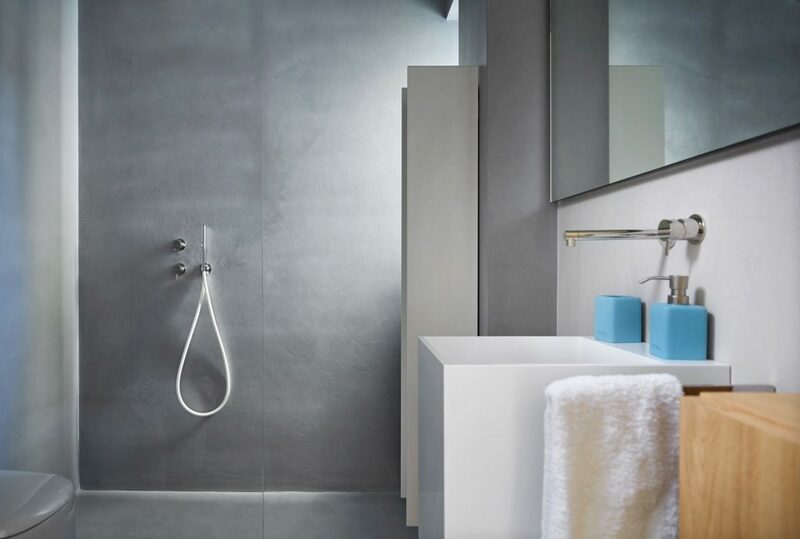 From a traditional bathroom to a modern one in a few weeks and without demolitions: it has been possible with Ideal Work®’s microcement coating Microtopping®, used here in its Smoke Grey colour on the entire surface. 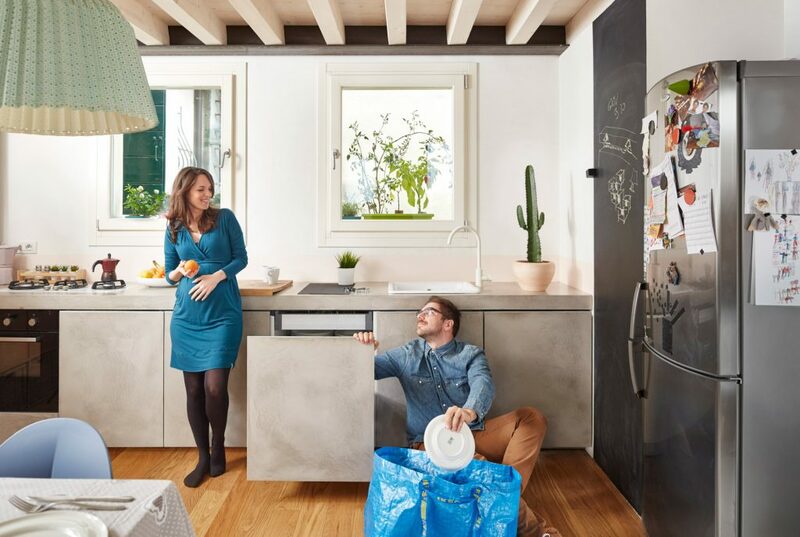 To give the kitchen a new look: that’s what a young couple wanted to do, by customizing their Ikea kitchen countertop with a Neutral Grey microcement coating, resistant to high temperatures and therefore ideal to cover their wooden kitchen and make it unique. Modernity and elegance for the Schüco showroon in Romania, where Microtopping® covers, in its Silver Grey shade, the walls and the table of the meeting room, highlighting the space with a super contemporary aesthetic.